Among the things “they” say is: “Timing is everything.” Like great photographs capture and express unique moments in time, the Who Shot Rock & Roll exhibit at Annenberg Space For Photography is an experience of time; the constant juxtaposition of the past and the present, in more ways than one. The exhibit is subtitled “A Photographic History, 1955 To The Present” which could be interpreted as a linear, chronological exploration of rock & roll, photography, or both. What the subtitle may not prepare you for is the impact and onslaught of emotions the exhibit inspires during and after its viewing. The initial display is exceptionally powerful, illustrating how photographers and artists have expressed their work visually, with increasing constraints on size, as music formats have changed throughout time. Of course that makes sense when you think about it, but as you take in the iconic album covers on the wall, hear the songs playing in your head, and feel the memories that accompany them, something shifts inside. It’s all very real, as if experiencing the album again for the first time. The exhibit takes you further through time, displaying the album art of 8-tracks, cassettes, and CDs. The graphical representation of albums comes to an abrupt halt just prior to MP3s. Who Shot Rock & Roll does a tremendous job of allowing visitors to experience and feel, at a core level, the crucial role visual art and photography play in music. Overcome with a level of respect and awe for photographers and artists that may bring chills, visitors then travel further through time, medium, and genre. Who Shot Rock & Roll is curated in such a way that it tells a story about the stories behind the photographs, which tell a story in and of themselves. The exhibit features prints from iconic photographers, including Amy Arbus, Diane Arbus, Roberta Bayley, Ed Caraeff, Stephanie Chernikowski, Danny Clinch, Ed Colver, Anton Corbijn, Henry Diltz, Jill Furmanovsky, Godlis, Lynn Goldsmith, Jean-Paul Goude, Bob Gruen, Ross Halfin, Dennis Hopper, Richard Kern, David LaChapelle, Michael Lavine, Annie Leibovitz, Laura Levine, Gered Mankowitz, Jim Marshall, Ryan McGinley, Shawn Mortensen, Marcia Resnick, Stephane Sednaoui, Norman Seeff, Mark Seliger, Pennie Smith, Storm Thorgerson, Albert Watson, and Guy Webster. It answers questions you may not have previously considered. What happens when a band dismisses the photo concept on the day of the shoot? How did photographs of Tina Turner reflect her spirit as she asserted independence in her relationship with Ike? How did the iconic photo of John Lennon in his New York City shirt come to be? How did Edward Colver capture that famous “Flip Shot” of skater Chuck Burke taken during Stiff Little Fingers / Adolescents / DOA show at Perkins Palace? How was that image of Michael Jackson captured? How did that Led Zeppelin album cover come to be? 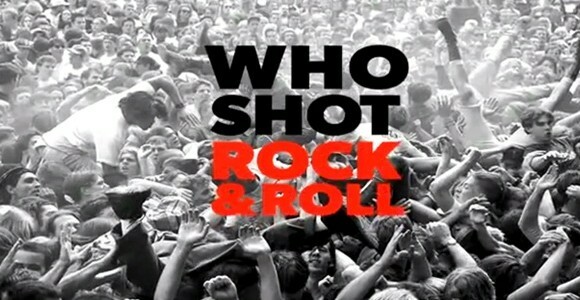 Who Shot Rock & Roll explores photo shoots along with live show, candid, and composite photography. It lends insight into the unique relationships between photographers and musicians. A wonderful documentary film, including interviews with the photographers and the musicians, can be viewed several times throughout the day. We were fortunate to catch the movie during the early portion of our visit, which added context as we made our way through the remainder of the exhibit. The Annenberg Space For Photography offers a smart-phone guided audio tour of Who Shot Rock & Roll, with stories narrated by the photographers, further bringing the experiences behind the corresponding photographs to life. For those who don’t have a phone with a QR reader app, The Annenberg has iPod Touch units and headphones that can be borrowed from the front desk. As we made our way toward the exit, my friend pointed at the growing line outside. “We came at the right time,” she said. The eclectic line of people waiting to get in to Who Shot Rock & Roll was also an exploration of time; a reminder of the timeless impact music and photography have on generation upon generation. We stopped by the merchandise display before leaving. 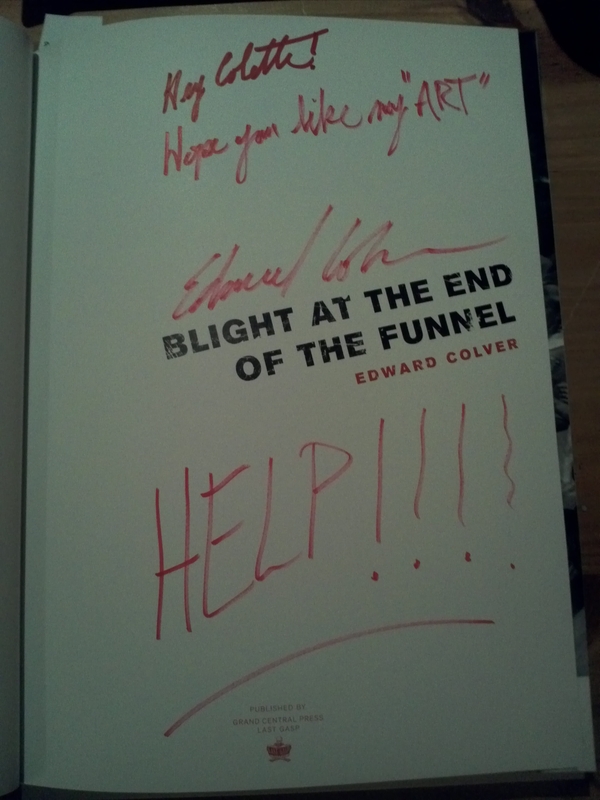 I began flipping through the striking photographs in Edward Colver‘s book, Blight At The End Of The Funnel. I noticed the books were signed and was overcome by a feeling. . . One by one, I opened the cover of every book and my intuition was confirmed – Colver had written something different in each book. I purchased the book that included my favorite inscription and left the building. Moments later, I saw Colver lighting a cigarette near the couches outside. As we approached, Colver introduced us to his wife, Karin, and invited us to sit down. We were then treated to an opportunity I might have dreamed of, but hadn’t expected. Colver shared his thoughts about Who Shot Rock & Roll, took us through some of the photographs in his book and told us stories behind capturing each one. We also talked about life, Los Angeles, and of course, music. Who Shot Rock & Roll is one of the more inspiring music events I’ve attended recently. Times have changed. High ticket prices and exorbitant “service fees” sometimes squash the spirit of live music. In many cases, recorded music has lost its visual counterpart. Some argue the concept of the album has died. Song titles have become track numbers. Mixtapes have been replaced by playlists on Spotify. As we become further physically removed from the true art of music, some (including many musicians) feel disheartened. Who Shot Rock & Roll reminds us: those who shot rock & roll are keeping its spirit alive. We can too. Who Shot Rock & Roll is on display at the Annenberg Space For Photography through October 7, 2012. Be sure to check out the “Iris Nights” lecture series, featuring some of the photographers whose work is on display at Who Shot Rock & Roll, as well. The lecture series takes place each Thursday, 6:30-8:00pm. This entry was posted in Events and tagged Albert Watson, Alice Cooper, Amy Arbus, Annenberg, Annie Leibovitz, Anton Corbijn, Bob Gruen, Danny Clinch, David LaChapelle, Dennis Hopper, Diane Arbus, Ed Caraeff, Ed Colver, exhibit, Gail Buckland, Gary Burden, Gered Mankowitz, Godlis, Guy Webster, Henry Diltz, Henry Rollins, Iris Nights, Jean-Paul Goude, Jill Furmanovsky, Jim Marshall, Laura Levine, Lecture series, Lynn Goldsmith, Marcia Resnick, Mark Seliger, Michael Lavine, Michael Ochs, Norman Seeff, Pennie Smith, photographers, photographs, Photography, photos, Richard Kern, Roberta Bayley, Rock & Roll, Ross Halfin, Ryan McGinley, Shawn Mortensen, Stephane Sednaoui, Stephanie Chernikowski, Storm Thorgerson, Who Shot Rock, Who Shot Rock & Roll.